Appropriately enough for a character actor of versatility and distinction, Bernard Hepton filled many roles in a six-decade-long career that included memorable appearances on stage and screen, running two leading regional theatres, producing and directing television drama and as a fight arranger for theatre and film. He will be best remembered for a succession of vivid television appearances that began with Sir Thomas More in a 1957 broadcast of Robert Bolt’s A Man for All Seasons. He began to make his mark as Thomas Cranmer alongside Glenda Jackson in The Six Wives of Henry VIII (1970) and Elizabeth R (1971), reprising the role for the 1972 cinema adaptation, Henry VIII and His Six Wives. No less notable were his humane German Kommandant in the prisoner of war drama Colditz (1972-74), the calculating Greek apparatchik Pallas to Derek Jacobi’s titular emperor in I, Claudius (1976) and an inscrutable Hungarian-born intelligence officer to Alec Guinness’ spymaster in Tinker Tailor Soldier Spy (1979) and Smiley’s People (1982). 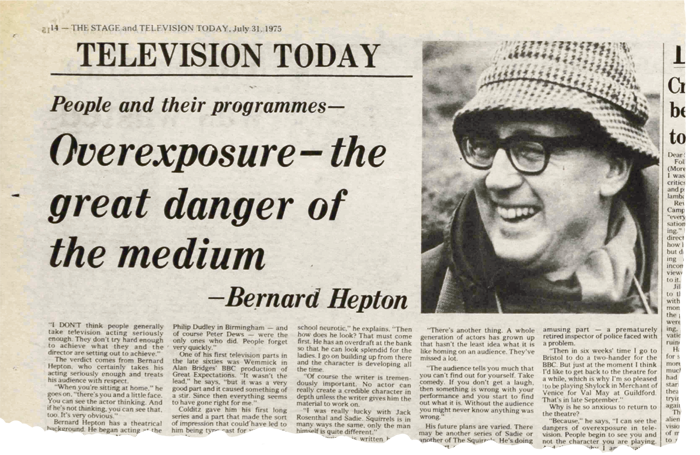 Those roles, together with Eric Chappell’s sitcom The Squirrels, based in the accounts office of a television rental firm, won him a Royal Television Society award for outstanding achievement in front of a camera in 1977. “When you’re sitting at home, there’s you and a little face. You can see the actor thinking. And if he’s not thinking, you can see that too, it’s very obvious,” he told The Stage in 1975. By then, Hepton was a veteran of almost 30 years. The son of an electrician, his first experience of drama had been in amateur productions while he was a draughtsman during the Second World War. Later, he was the first student to enrol in Esme Church’s Northern Theatre School and appeared with the children’s company of the Civic Playhouse in his home town of Bradford in 1948. Hepton’s early professional career was marked by appearances in rep in York and Scarborough before he joined the Birmingham Repertory Theatre, then still managed by its founder, Barry Jackson, to play several parts in the Henry VI trilogy, which was also seen at London’s Old Vic, in 1950. In a decade-long stay in Birmingham, he began to direct and arrange fights (usually in collaboration with John G Greenwood), the latter skill leading to invitations from the Shakespeare Memorial Theatre and Old Vic to choreograph duels in a number of productions, including Richard Burton’s Hamlet in 1953. He also arranged the fight sequences for Laurence Olivier’s 1955 film version of Richard III. Early directing credits in Birmingham included the premiere of RC Sherriff’s portrait of the last Romans in Britain, The Long Sunset (1955), Julius Caesar (1956) and George Farquhar’s The Beaux’ Stratagem, with a young Albert Finney as Archer in 1957. The same year he succeeded Douglas Seale as the company’s artistic director, a position he held until 1961. Notable productions during his tenure included Finney’s Macbeth (1958), Ian Richardson’s Hamlet (1959) and the two parts of Henry IV (1960). After stepping down from Birmingham Rep in 1961, Hepton ventured into writing when Mister Universe, a musical co-written with Norman Bennett, was staged in Birmingham before he joined the BBC as a producer and director. There, he produced episodes of Thursday Theatre, the Wednesday Thriller, football drama United!, popular publishing-world serial Compact and JB Priestley’s Johnson Over Jordan, starring Ralph Richardson. He spent a year running Liverpool Playhouse where he tried to broaden its repertoire before abruptly leaving due to “differences of opinion” over his programming policy with the board. In 1966, he served as artistic director of the Malvern Festival. Returning to acting, Hepton appeared as Caiaphas in Dennis Potter’s television play Son of Man (1969) and Grumio (The Taming of the Shrew) with the Bristol Old Vic on a tour to Latin America in 1971 before becoming a familiar face in television’s Colditz the following year. Later stage appearances included a tour of Terence Rattigan’s The Winslow Boy in 1980, Alan Ayckbourn’s Seasons Greetings (Apollo Theatre, 1982) and Gabriel Garcia Marquez’s tatterdemalion ex-army officer in No One Writes to the Colonel at the Lyric Studio and Riverside Studios, Hammersmith in 1991. In 1995, Hepton won a Sony radio award for his performance as the British composer in David Pownall’s Elgar’s Third. Hepton was married to the actor Nancie Jackson from 1957 until her death in 1977, and the drama coach Hilary Liddell from 1979 until she died in 2013. 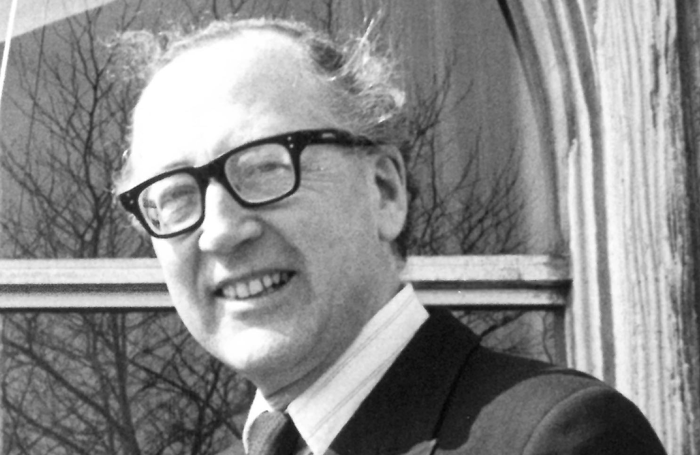 Francis Bernard Heptonstall was born on October 19, 1925 and died on July 27 aged 92.